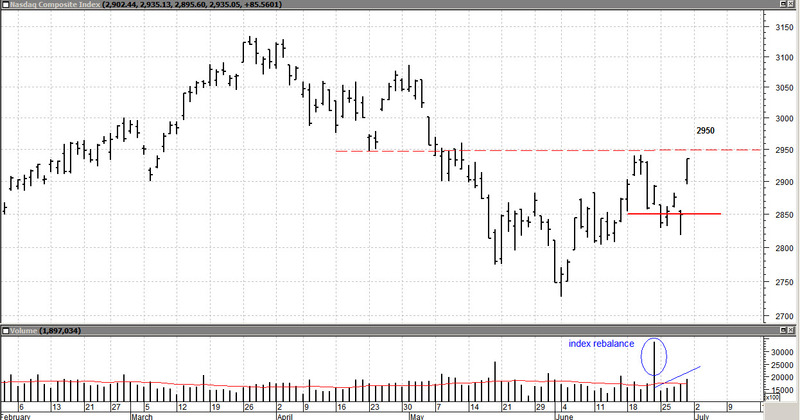 Euphoria was an apt description for the price action on Friday. All indexes were up sharply on the news coming out of Europe that the European Central Bank would actually “bail out” individual banks in the troubled countries. Crisis averted ? Yes, but perhaps only for a while. The big unanswered question is just how many banks in how many countries need this liquidity. Greece, Spain, Portugal, Italy, Ireland . . . . the “applications” are large indeed. So . . . there is hope, and this is the time to be cautious but decisive. How do I do that? Answer: scale into positions. Buy a little, wait, buy a little more, wait; you get the picture. No one say that you need to be all in or all out. The pro’s scale in (and out), so should you. Where is the strength right now? 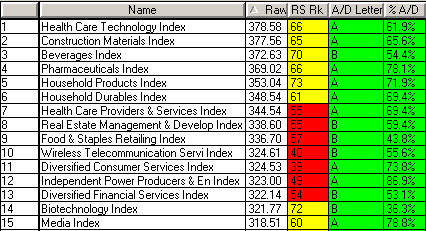 The table below shows the top 15 industry sectors (out of 68). That’s a good place to start if you’re buying stocks or ETF’s (mutual funds are a different story). A refresher: Raw Score is based on recent price strength; RS is recent Relative Strength (strength compared to the rest of the market); AD is Accumulation / Distribution ranking; A top 20%, B second 20%, etc.. AD% is the actual Accum./Dist. % from +100 Accumulation (buying) to -100 Distribution (selling). Healthcare and Pharma along with a number of defensive sectors lead the way. These sectors will change toward more aggressive sectors (technology, finance) IF this market continues to improve. That’s it for this week. Have a great 4th of July (US folks) and a good week to all. Fell free to post comments & suggestions at the top of the blog. BTW: my monthly Client Newsletter is now published under the Newsletter tab above; click on the image to enlarge it.